If your photos, documents and music does not open normally, their names modified or admin@prt-decrypt.xyz added at the end of their name then your PC system is infected with a new ransomware virus named “Paradise .xyz ransomware“. This virus can encrypt all files stored on a computer disks and attached network drives. The ransom note encourages victim to contact Paradise .xyz ransomware’s makers via the admin@prt-decrypt.xyz email in order to decrypt all files. These persons will require to pay a ransom (usually demand for $300-1000 in Bitcoins). We do not recommend paying a ransom, as there is no guarantee that you will be able to decrypt your documents, photos and music. Especially since you have a chance to restore your files for free using free tools like ShadowExplorer and PhotoRec. Therefore it’s very important to follow the few simple steps below immediately. The steps will allow you to get rid of Paradise .xyz ransomware. What is more, the steps below will allow you restore encrypted files for free. Currently there is no available method to decrypt .xyz files, but you have a chance to restore encrypted personal files for free. The virus uses a strong encryption algorithm with strong key. What does it mean to decrypt the files is impossible without the private key. Use a “brute forcing” is also not a solution because of the big length of the key. Therefore, unfortunately, the only payment to the creators of the Paradise .xyz ransomware entire amount requested – the only way to try to get the decryption key and decrypt all your files. There is absolutely no guarantee that after pay a ransom to the makers of the Paradise .xyz ransomware virus, they will provide the necessary key to decrypt your files. In addition, you must understand that paying money to the cyber criminals, you are encouraging them to create a new virus. Most commonly it’s not possible to remove the Paradise .xyz ransomware virus manually. For that reason, our team developed several removal solutions which we’ve summarized in a detailed tutorial below. Therefore, if you have the Paradise .xyz ransomware virus on your computer and are currently trying to have it uninstalled then feel free to follow the few simple steps below in order to resolve your problem. Read this manual carefully, bookmark or print it, because you may need to close your internet browser or reboot your computer. We advise using the Zemana Anti-malware. You can download and install Zemana Anti-malware to find out and remove Paradise .xyz ransomware virus from your computer. When installed and updated, the malware remover will automatically scan and detect all threats exist on the computer. Visit the following page to download Zemana Free. Save it to your Desktop so that you can access the file easily. When the download is done, start it and follow the prompts. 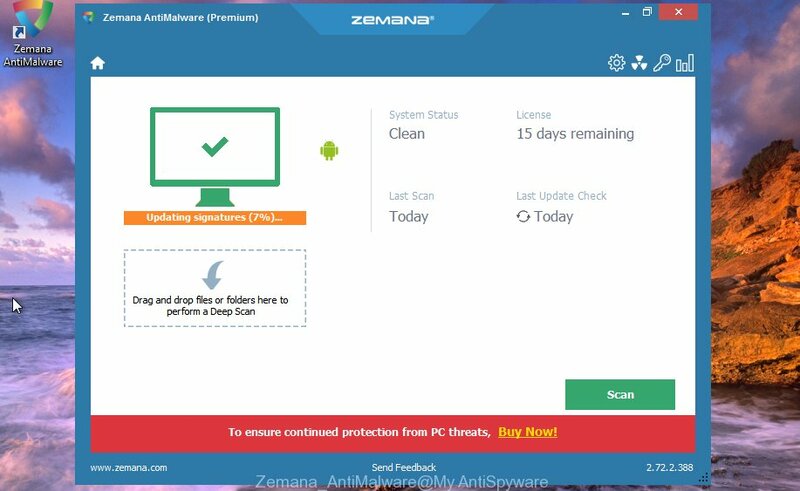 Once installed, the Zemana Anti Malware (ZAM) will try to update itself and when this task is finished, click the “Scan” button to begin checking your PC for the Paradise .xyz ransomware virus and other malware and potentially unwanted apps. A scan can take anywhere from 10 to 30 minutes, depending on the number of files on your PC and the speed of your computer. 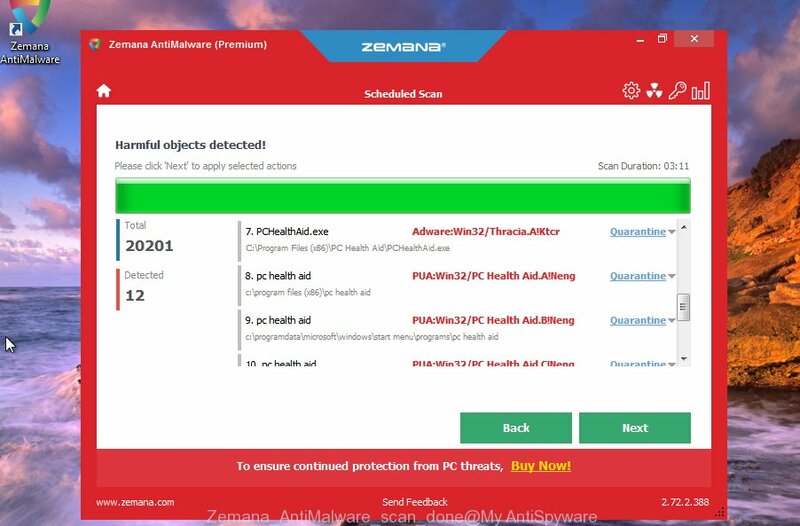 While the Zemana Free program is checking, you can see how many objects it has identified as threat. Make sure all items have ‘checkmark’ and click “Next” button. The Zemana will remove Paradise .xyz ransomware virus and other security threats. Manual Paradise .xyz ransomware virus removal requires some computer skills. Some files and registry entries that created by the ransomware may be not completely removed. We suggest that run the MalwareBytes that are completely free your computer of ransomware virus. Moreover, this free program will help you to delete malware, PUPs, adware and toolbars that your machine can be infected too. After the download is done, close all apps and windows on your PC. Double-click the set up file called mb3-setup. If the “User Account Control” prompt pops up as shown below, click the “Yes” button. Once installation is done successfully, click Finish button. MalwareBytes AntiMalware (MBAM) will automatically start and you can see its main screen as shown on the image below. Now click the “Scan Now” button to detect Paradise .xyz ransomware virus related files, folders and registry keys. Depending on your machine, the scan can take anywhere from a few minutes to close to an hour. When a malware, ad-supported software or PUPs are found, the number of the security threats will change accordingly. Wait until the the scanning is finished. 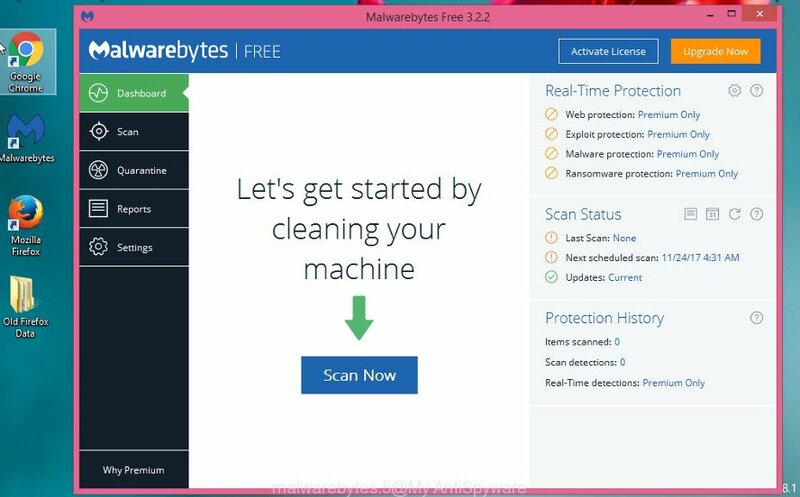 After MalwareBytes AntiMalware has finished scanning your personal computer, MalwareBytes Free will display you the results. Make sure all threats have ‘checkmark’ and click “Quarantine Selected” button. The MalwareBytes will start to remove Paradise .xyz ransomware virus and other security threats. When the process is finished, you may be prompted to restart the machine. 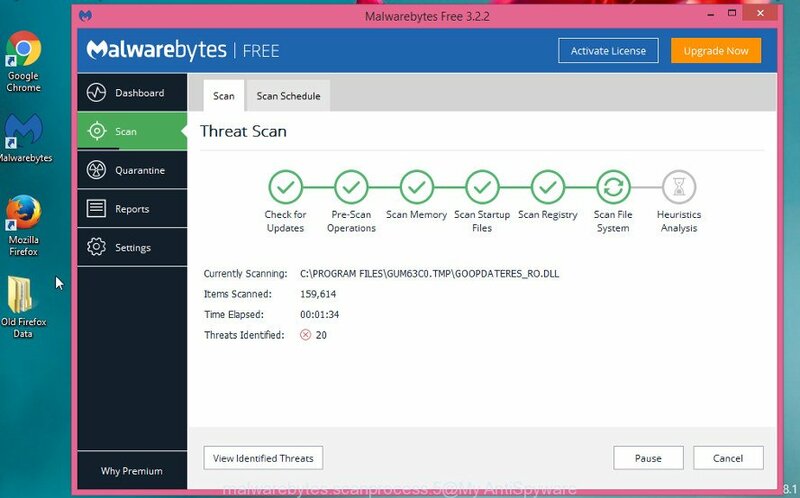 We recommend you look at the following video, which completely explains the procedure of using the MalwareBytes Free to remove adware, hijacker infection and other malware. KVRT is a free removal utility that can be downloaded and run to remove ransomware, adware, malicious software, potentially unwanted software, toolbars and other threats from your system. You can run this utility to scan for threats even if you have an antivirus or any other security program. 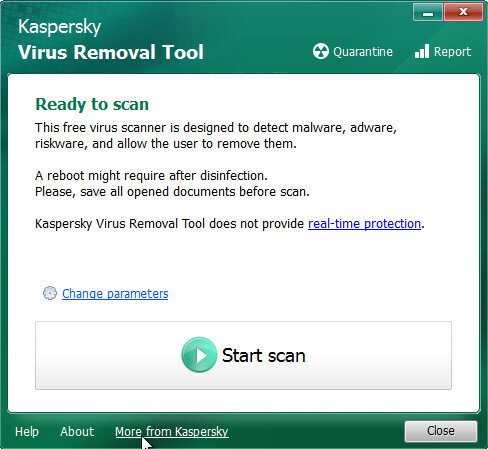 Once downloading is complete, double-click on the Kaspersky virus removal tool icon. Once initialization process is finished, you will see the KVRT screen as shown on the image below. Click Change Parameters and set a check near all your drives. Press OK to close the Parameters window. Next click Start scan button to search for the Paradise .xyz ransomware and other known infections. This procedure can take some time, so please be patient. During the scan KVRT will look for threats present on your PC. After finished, Kaspersky virus removal tool will show a screen that contains a list of malicious software that has been detected as shown in the following example. You may remove items (move to Quarantine) by simply click on Continue to begin a cleaning procedure. In some cases, you can recover files encrypted by the Paradise .xyz ransomware. Try both methods. Important to understand that we cannot guarantee that you will be able to recover all encrypted photos, documents and music. 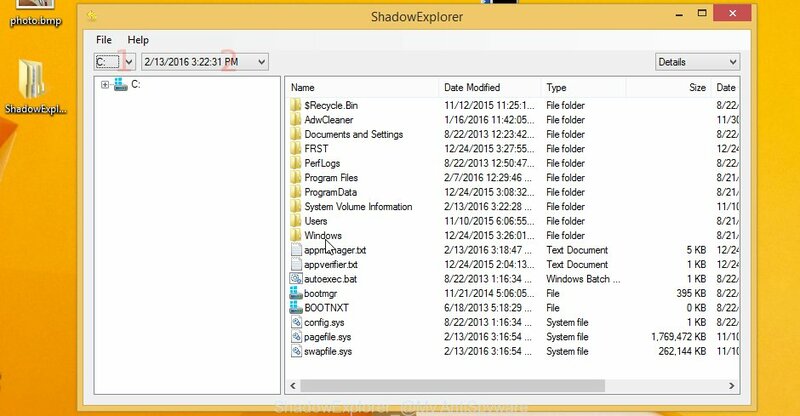 Visit the following page to download the latest version of ShadowExplorer for Windows. Save it on your MS Windows desktop. Start the ShadowExplorer utility and then select the disk (1) and the date (2) that you wish to recover the shadow copy of file(s) encrypted by the Paradise .xyz ransomware virus as displayed below. Now navigate to the file or folder that you wish to recover. When ready right-click on it and press ‘Export’ button as shown below. Before a file is encrypted, the Paradise .xyz ransomware virus makes a copy of this file, encrypts it, and then deletes the original file. 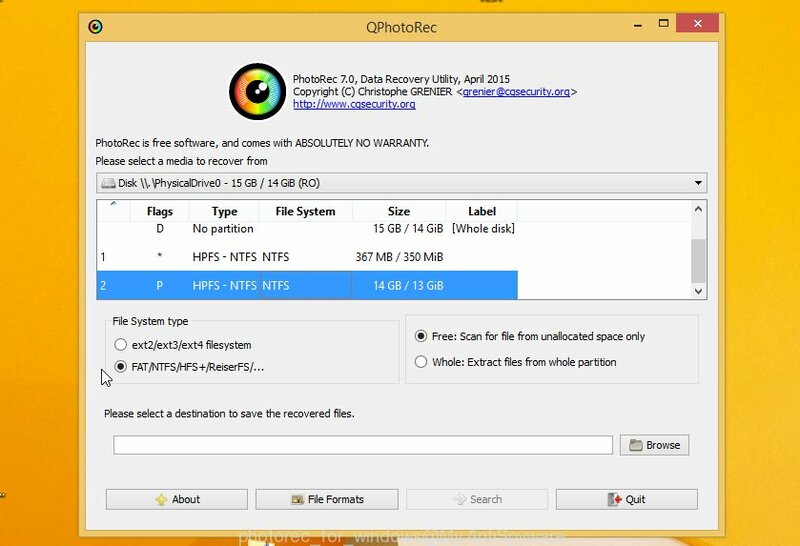 This can allow you to recover your documents, photos and music using file recover software like PhotoRec. Once the download is complete, open a directory in which you saved it. 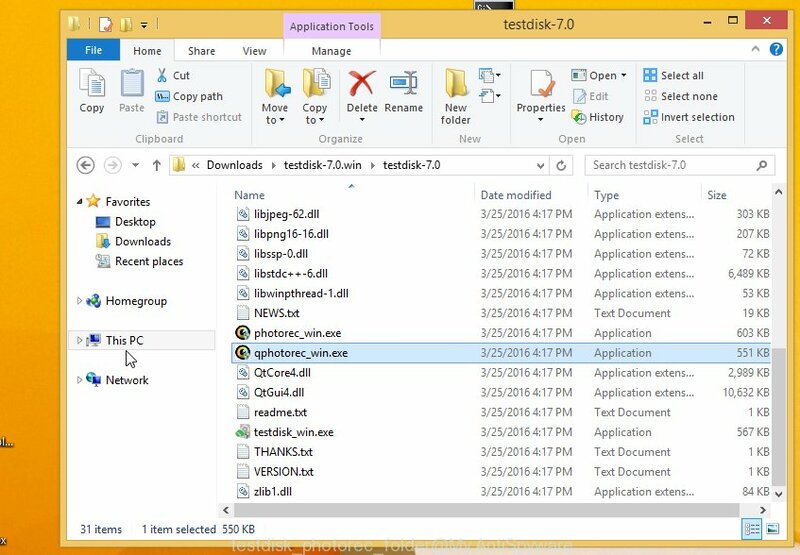 Right click to testdisk-7.0.win and choose Extract all. Follow the prompts. Next please open the testdisk-7.0 folder as displayed on the image below. 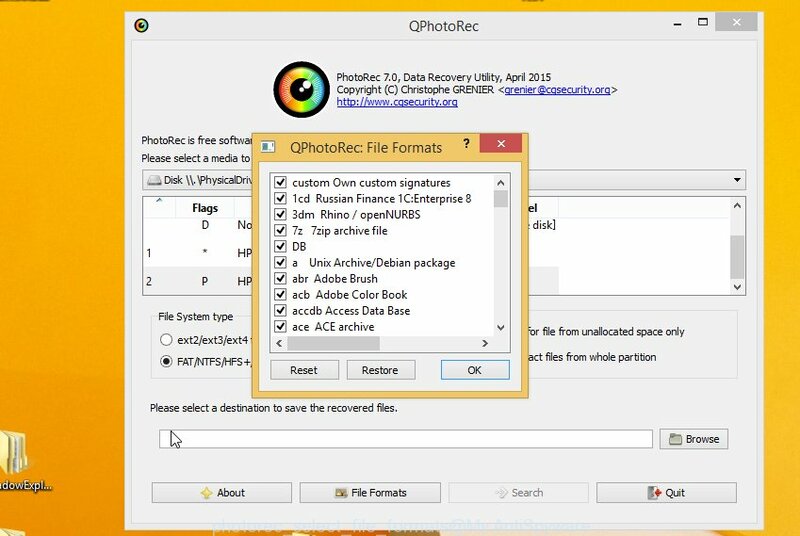 Double click on qphotorec_win to run PhotoRec for Microsoft Windows. It will open a screen as displayed on the image below. You will see a list of available partitions. Select a partition that holds encrypted personal files as displayed on the screen below. Click File Formats button and specify file types to restore. You can to enable or disable the recovery of certain file types. When this is done, click OK button. Next, click Browse button to select where restored photos, documents and music should be written, then press Search. When the recovery is done, click on Quit button. Next, open the directory where recovered personal files are stored. You will see a contents as shown in the figure below. All recovered photos, documents and music are written in recup_dir.1, recup_dir.2 … sub-directories. If you’re searching for a specific file, then you can to sort your restored files by extension and/or date/time. Most antivirus apps already have built-in protection system against the ransomware. Therefore, if your computer does not have an antivirus program, make sure you install it. As an extra protection, run the CryptoPrevent. 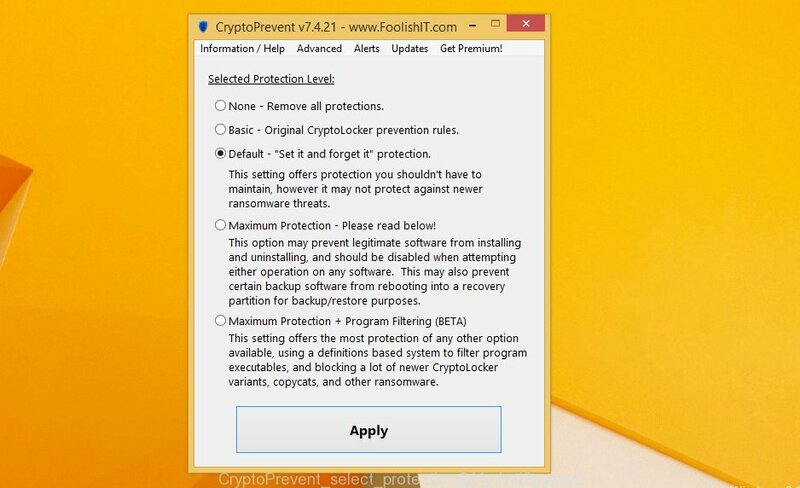 Download CryptoPrevent from the following link. Run it and follow the setup wizard. Once the installation is complete, you will be shown a window where you can choose a level of protection, as shown on the screen below. After completing the few simple steps above, your personal computer should be free from Paradise .xyz ransomware virus and other malware. Your PC will no longer encrypt your personal files. Unfortunately, if the instructions does not help you, then you have caught a new ransomware, and then the best way – ask for help here.